MicroRidge offers a wireless system that gives you the greatest range of options and flexibility for wireless measurement collection. 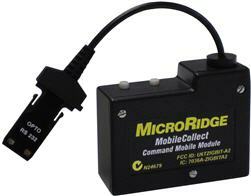 MobileCollect represents the 3rd generation of wireless measurement collection from MicroRidge and expands upon the capabilities of GageWay Wireless. MobileCollect features new technology, new features and new pricing made possible by more highly integrated radio technology. MobileCollect supports the broadest range of digital and RS-232 gages, scales, and interfaces from manufacturers such as Brown & Sharpe, CDI, Federal Maxum, Fowler, LMI, Mahr Federal, Mitutoyo, Ono Sokki, Starrett, Sylvac, etc. and also - our own GageWay line of interfaces. A basic wireless system consists of a transmitter and a base. With MobileCollect you can also choose from several transmitter and base options to fit your gaging and measurement collection requirements. MobileCollect offers features and functionality not found in any other wireless system. The Mini Mobile Module is used to capture measurements from most digital and RS-232 handheld gages such as calipers, micrometers, digital indicators, etc. and has the ability to send a command from a base unit to initiate a gage reading. The Command Mobile Module is used to capture measurements from most digital and RS-232 handheld gages such as calipers, micrometers, digital indicators, etc. and has the ability to send a command from a base unit to initiate a gage reading. Automatically turn itself off after each reading. No power switch required. Gage cable in lengths up to 72"
Battery life will be less when used in the Command mode. Responds to read requests and sleep cycle commands from a base unit. Allows you to provide complete remote control of a mobile module. Automatically turns itself off after each reading. No power switch required. Contact for pricing and ordering information. The RS-232 Mobile Module supports RS-232 gages not supported by the Digital Mobile Module or the Command Mobile Module. The RS-232 Remote is used when you have an RS-232 serial device, such as a gage interface or a scale, in a non-mobile setup that you want to connect to the wireless system. Same as the Command Mobile Module except the range is up to 100 feet and battery life will be influenced by RS-232 interface requirements. Use for RS-232 devices that are not supported by the Digital Mobile Module. The serial port looks like a serial port on a PC and can accept data from any RS-232 serial device. Connect an external read switch (hand switch, foot switch, etc.) to the Remote so you can send a user-defined command to your RS-232 serial device. The bases receive measurements from transmitters (Mobile Modules and Remotes). The bases are connected to a PC or laptop by a USB or RS-232 port. All data sent to USB ports appear as standard RS-232 data to your application. MobileCollect is fully compatible with the previous GageWay Wireless system. The USB Base receives measurements from Mobile Modules and Remotes. Connects directly to a USB port on a PC or a laptop. It is powered by the USB port. The RS-232 Base receives measurements from Mobile Modules and Remotes. Connects directly to an RS-232 serial port and is powered by a separate AC adapter. RF Sniffer determines clear channels for the most reliable operation. Supports an unlimited number Mobile Modules. Configured by an easy-to-use Windows setup program. Range is up to 133 feet. You can have several base units adjacent to each other. Each base will only receive data from the Mobile Modules or Remotes that have been associated with the base. Data sent to the PC consists of ASCII strings that are accepted by virtually all SPC-DAQ software. WedgeLink Xpress keyboard wedge included at no additional charge. Setup Program Not required for most configurations. Easy to use when needed. Required. Often difficult to install, use and understand. Saves installation and startup time. RF Sniffer Built into the USB Base to determine available RF channels Not available Allows you to configure system on channels not currently being used by other 2.4 GHz radios. LED visibility LEDs placed so that acknowledgement received from the base is highly visible to the user LEDs placed so that base acknowledgement is difficult or impossible to see With MobileCollect, it is very obvious that the base received the reading. Send commands from Base to Mobile Module Remotely request gage measurements Not available Obtain readings from a gage without needing an operator to press button on gage or Mobile Module. Can be useful in gage fixtures. Computer connection Both USB and RS-232 USB only Greater flexibility in connecting to PCs, PLCs, etc. Field upgradeable firmware User can upgrade all firmware in the field Not apparent that this is available Allows you to add new features by downloading upgrades from the web site. Gage cable replacement Gage cable replacement is minimized since the Mobile Module is securely attached to gages like cables and micrometers. Some companies do not attach the transmitter to the gage resulting in premature cable failure and replacement Minimize down time and cable cost due to more frequents cable failure and replacement cost.